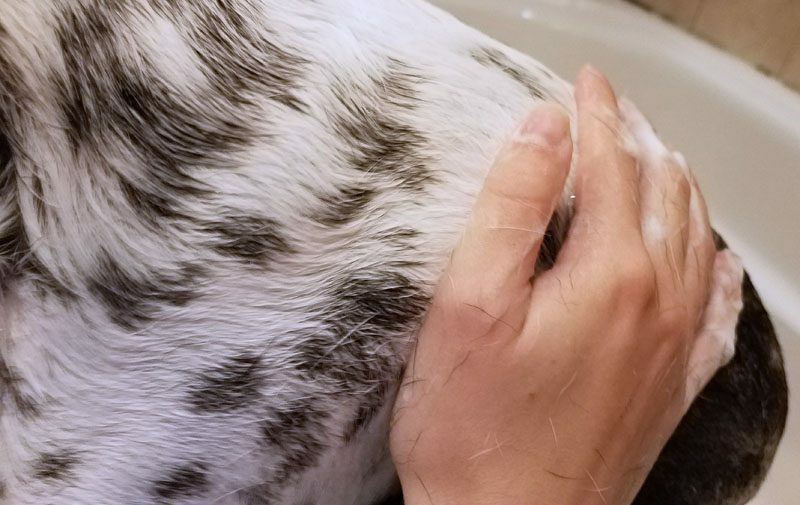 Cow, like many dogs, gets pink, itchy skin from time to time. This is especially common in dogs with white fur. Her predominantly white coat could contribute to the sensitivity of her skin. Last year, her skin was at its absolute worst. She was very red, itchy, and she lost a lot of the fur on her chest and belly. She shed constantly, and she was miserable. I was feeding her a poultry-based kibble for a few months at that time, so I suspected that she had developed a chicken intolerance. Food intolerances have been shown to cause yeast infections of the skin, ears and paws, which would explain that doughy smell. Now that she eats a homemade raw diet with no chicken, her itchy skin has mostly subsided. For the most part, though, the fur on her neck and chest has not grown back. She still gets pink, and when she does, I give her a bath to relieve the itch. Bathing her in a medicated shampoo works instantly – she looks much better right out of the bath. I noticed that her medicated shampoo, though it contained antifungal chemicals that killed the yeast residing on her skin, also stripped away her skin and coat’s natural oils. While she was no longer itchy, her fur felt dry, as though it needed to be conditioned. 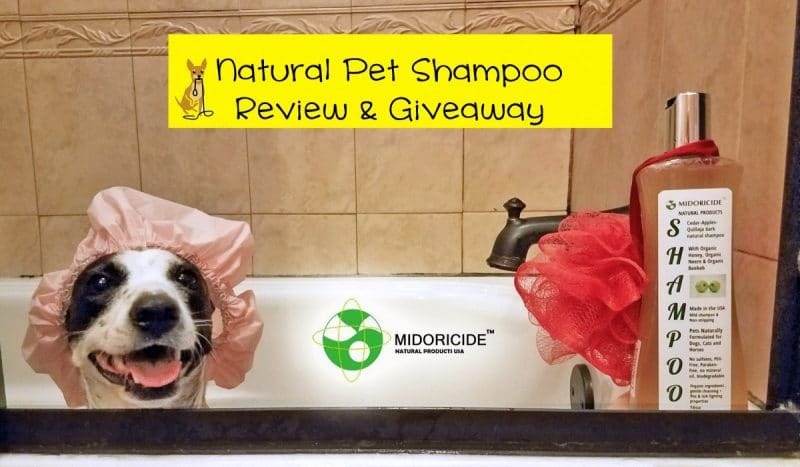 So, I was glad to get the opportunity to review natural pet shampoo from Midoricide. I was provided with a free product sample and compensation for my review. I only recommend products I love and use on my own dogs on Little Dog Tips. 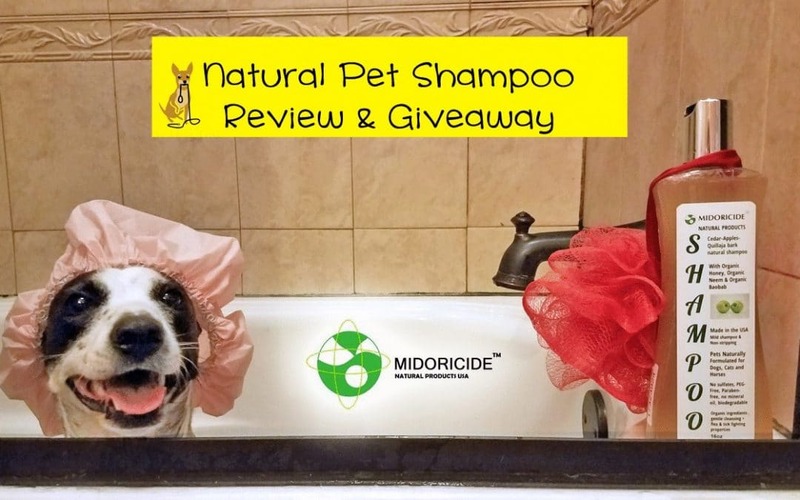 What Is Midoricide Pet Shampoo? Midoricide is an essential oil based shampoo for dogs, cats and horses. Among the organic ingredients are apple cider vinegar, neem oil, honey, lemongrass and cedarwood oil. It’s made to be antibacterial, antimicrobial, conditions skin and fur, and even helps fight fleas and ticks. You can find a full list of ingredients on their website. The shampoo arrived just as Cow was, coincidentally, experiencing some pinkness and itchiness. So I was glad to be able to give it a try right away and hopefully provide her with some relief before the irritation got worse. As I normally do with the medicated shampoo, I kept Cow lathered up for 5 minutes to kill any bacteria or fungus on the surface of her skin. Then, I rinsed her completely. Then, I towelled her off and let her loose to complete drying by dashing spastically through the hallway and rolling around in her bed. I didn’t see her for a few minutes while I cleaned the tub. When I was done, my mother commented on how shiny Cow was, and took pictures of her – she didn’t even realize we were testing out a new shampoo. Cow really was shiny. The natural shampoo was not drying, but it did eliminate the pinkness and itching. There’s just a few ways I felt Midoricide could be improved. When you open the bottle and pour it into your hand, you’ll notice that it has a very strong scent. The apple cider vinegar cuts through the other scents. and the cedarwood oil also adds its own powerful aroma. Even so, I’ve used apple cider vinegar for Cow’s itchy skin, and I’ve even used cedarwood oil to repel fleas and ticks. Both ingredients lose their pungent aromas once dried. So, when Cow’s fur was completely dry, I could take a big whiff of her neck fur and only detect a mild, pleasant scent. So, this is not a big deal, and would not dissuade me from using this product. I also realize that these powerful aromas can help kill and repel fleas and ticks. I wouldn’t expect the shampoo to repel all fleas and ticks if used monthly or less frequently, but it can certainly be used as part of a plan to rid your pets of fleas. Unlike chemical flea and tick killers, though, Midoricide is safe for cats. I also noticed that the shampoo is watery, so it was difficult to pour out a small amount. If it were slightly thicker, it’d be a bit easier to pour out the exact amount you need, but like most natural shampoos, it’s slightly different than others, so this wasn’t unexpected. Yes, absolutely. A large bottle will last a long time, and it can be used to prevent or help treat common skin issues. It’s good to have even if your pets don’t have skin issues, because you won’t have to buy separate products if they ever get fleas, dandruff, mild skin irritation or inflammation. I’m glad to have it, and know you will too. My poor fur baby has very bad skin allergies and is very itchy often. I would love to try this one him! It sounds great. My dachshund has an odor problem even with frequent baths, especially the ears. I would love the opportunity to give this shampoo a trial. Hope it’s the one to help Dobsie! Hope this works for skin allergies!!!!!!!!!!!!!!!! Have spent a FORTUNE in VET BILLS!!!!!!!!!!!!!!!! Where do I purchase this product? I definitely would try this out. My pittie’s skin often gets pink and itchy. I think this would help. This sounds like something great for our dog, who has had her bouts with itchy dry skin. I think it sounds like a great product! I would love to try it! I would love to try it. My pup could use this! I like that the product is made with natural ingredients. I would definitely like to try this on my dogs. It looks good being all natural! I just got a puppy that has skin issues and I’d love to try this! I’m all for trying any all natural products that would help my dogs. Sounds like it would help with the itchy skin. My doggy won’t like it, but I will love a new a shampoo! It sounds very good! I’ve had the same problem, of the shampoos drying my doggy’s skin out. He is an old boy, so his skin is delicate. I am interested in this product. I like how it can help treat skin issues and inflammation in dogs. Sounds safe and I would like to try it. Need this so much for my two mini dachshunds who have skin issues! I think this would be great for one of my dogs, who has itchy skin. sounds like something great for our dog! I would like to try it because my heidi has very itchy skin. This looks great, Lindsay! I will try this with my puppy. I really thank for sharing this article. Mostly dog shampoo effected the skin but this is a great anti bacterial dog shampoo special and also very easy to use. I have 3 dogs, now I can use this product for my dog and this is very effective. This product is also protected your pet’s skin. So again thanks. Just wanted to let you know that I was the winner and I love this product! I have a very skin sensitive and itchy boy and this has really worked wonders on him! I’ve tried many products and Midoricide is my favorite. It works immediately and stops him from scratching and chewing himself to death! A little goes a long way and I am definitely buying more when we run out. Thank you so much! That’s so fabulous to hear Tracey, thanks so much for coming back and letting us know! Is this good for all dog breeds and also for other pets? Very well explained I’ll try this product for my dog. Is this applicable for cats? this shampoo seems so effective I’m gonna try this to my cat if it is applicable because the skin beneath his ears is slightly damage due to irritations.